Adjustable waist size for the perfect fit. Multiple pockets inside & outside are designed to carry lipsticks, sponges, shading & shadow brushes, hair combs & brushes, pencils, puffs, cotton swabs, eye liner, Make-up, creams and more. Padded inside the waist for extra comfort. Spray bottle holder fits on the belt. This also can be used for hair spray or bottled water. Carrying case with handles for easy belt storage comes with multiple outside pockets for additional products. Three accessories in one product. 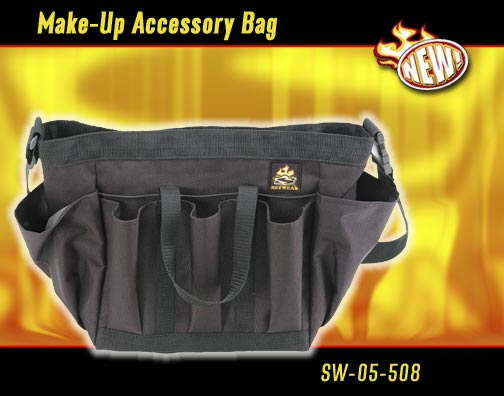 Made with style and strong ultra light-weight 1000D nylon material. Carrying case overall size is; 18"x10"x6"
Belt overall size is 13" long x 5" deep x 11" tall. Holds everything you need to help maximize your potential.